2012.07.05 2. [Morricone's "The Mission"] 모리콘 "미션"
직접 녹음한 즉흥 젓가락 행진곡! "Touch the Peace" 스타인홀에서 연주!!! 뉴욕에있는 스타인홀 지하실! 6pm-9pm까지 연주 녹음! 박찰리- "Touch the Peace" 스타인웨이홀에서 연주! 오늘도 뷰티풀한음악으로 하루를 시작하세요! SMILE! CLASSICAL PIANIST 클라식 피아니스트 찰리올브라이트! 콘서트 끝맞히고 Hall Director 와 함께!! Steinway Artist 에 소속되어있는 Charlie Albright! Steinway & Sons 에서 아티스트들에게 연습할 수 있는 공간을 빌려주기도 한답니다! 항상 열심히 연습하고 열심히 사는 찰리 올브라이트! 2. [Morricone's "The Mission"] 모리콘 "미션"
[Morricone's "The Mission"] 모리콘 "미션"
Among Harvard students, Charlie Albright ’11 is a pre-med economics concentrator in Leverett House. However, as the Washington Post writes in their February review, Albright is “among the most gifted musicians of his generation.” On Albright’s website, Joe Biden is quoted as saying to him, “If I did my job as well as you do yours, I’d be President.” Now, Albright, the first classical pianist ever enrolled in the Harvard/New England Conservatory of Music (NEC) Five-Year B.A./M.M Joint Program, looks ahead as his last few months at college draw to a close in hopes of launching a full-time professional career. The Harvard Crimson (THC): How did you enter the world of music? Charlie Albright (CA): I was three and a half, so I only go by what I’ve been told that happened because I don’t remember. We had an upright piano in our house because [of] my mom—she’s from Korea, so almost every Korean knows how to play a little bit of piano, right—[and] she would play every once in a while. I climbed up on the bench and started pecking out “Twinkle, Twinkle, Little Star.” She saw that I had a knack for it. For several years, I played by ear, and when I was seven, I met my first real classical teacher, Nancy Adsit. THC: Did you consider a strictly conservatory experience? CA: Yeah, I did. I applied to a lot of schools, both conservatory and non-conservatory, and a lot of joint programs. I love music but I didn’t know if that is what I wanted to do solely because I was scared that if music didn’t work out, I [would] end up under the bridge. I knew my parents couldn’t support me, so I had to be able to do something where I could support myself. Medicine was something I was really interested in, and business, which is where economics comes in. I knew I wanted to do a joint program because it is a good fall-back. THC: Do you feel like the joint program has prepared you well as a musician? CA: Yes. It’s interesting because the joint program itself doesn’t require an immense amount of work. Getting into it is competitive but once you’re in it, you don’t have to go there for classes all the time [and] you can take classes that will double count for your master’s and your bachelor’s [degree]. So, it’s not a lot of work in terms of that, but what takes up a lot of time is traveling and giving concerts. It can get kind of rough. THC: It has been announced that you are to be the next Artist-in-Residence of Leverett House. What will that be like? CA: [The position] will begin next year. I’ll be around because I’ll be doing my fifth year of Masters [at the New England Conservatory] so I’m going to be around campus. It’ll be different because my closest friends will all be gone and I technically won’t be a student here. It will be kind of weird ... but I will still know a lot of people. THC: After you complete your masters degree at the NEC, what do you plan on doing? CA: I’m not sure. I want to do piano, but it’s hard. I’m giving myself a year and a half until I finish my Masters and seeing where the ball is going. If it looks like it’s going well, I’ll probably keep at it a little longer. If not, then I’ll apply for medical school that year and start the following year. THC: You’ve played three concerts with Yo-Yo Ma at the age of 22. Are there any musical milestones you have yet to pass? CA: Oh yeah, an immense amount. It’s not like pre-med. For most people, pre-med is pretty straightforward. It’s very hard, but it’s very straightforward. You go to high school, you go to college, you take pre-med classes, you take the MCAT, you go to med school, do the residency, and you’re a doctor. Easier said than done. But with piano or any music, so much of it is good fortune and luck and having great mentors and being in the right place at the right time. So, it’s a lot harder. There’s no way to become a concert pianist. THC: What role do you think music will have in your life? CA: Ideally, I would be a concert pianist, full time, and maybe a professor at a conservatory. That would be ideal but it’s really hard. You know the saying, “How do you get to Carnegie Hall? Practice, Practice, Practice.” [But I think] it’s “practice and be lucky.” Sometimes, I would put my money on me becoming a movie star before a classical musician. But I think music will always be part of my life. I’ll always play for myself. [Charlie Albright] AVAILABLE ON ITUNES NOW! CHAMBER music long ago left the chamber, migrating to the concert hall and all manner of modest stages. But even in this age of musical democratization, it is noteworthy when ordinary music lovers year after year band together to bring first-rate chamber fare to their communities. That is what Friends of Music has done. With little fanfare, this group — a single-minded, self-renewing collection of volunteers who live in Westchester County — has, for nearly six decades, presented established and emerging artists in a concert series that arguably rivals some of the best. And it has done so in unassuming locations like schools in Croton, Briarcliff Manor, Ossining, Pleasantville and Sleepy Hollow, where the series has taken up residence in the high school. Betsy Shaw Weiner, who began as a subscriber to the concert series and is now the group’s president, attributed its ability to attract world-class performers in part to a reputation, slowly and steadily built, among managers and agents who know their artists will receive a respectful presentation before a knowledgeable audience. For its part, she said, the audience, whose ranks now include about 500 subscribers, has generously supported the concerts. This season, the concerts have presented the Emerson String Quartet, Trio Con Brio Copenhagen and, in solo performance, the up-and-coming pianist Charlie Albright. 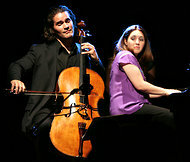 Over the next six weeks, the format will expand with the appearances of the Carducci String Quartet; the cellist Zuill Bailey, playing solo and in duo with the pianist Navah Perlman; and, closing the season, Juilliard Baroque, which, at 12 pieces, will be the largest aggregation of musicians yet on a Friends of Music stage. Ms. Weiner acknowledged that the series’ range of repertory does not always match the diversity of its formats. While it occasionally programs recently composed works, she said, “we’re still trying to draw the audience into the 20th century.” The newest, and possibly most adventurous, piece scheduled for the rest of this season is Shostakovich’s String Quartet No. 3, a postwar commentary on conflict. It will join works by Haydn, Brahms, Chopin and Bach, whose writing falls squarely in the audience’s comfort zone, though the Juilliard group’s informed approach to it may not. In fact, it is often the performances or performers more than the repertoire that generate the most curiosity. The Carducci quartet, for example, is made up of two married couples — one, the first violinist Matthew Denton and the cellist Emma Denton; the other, the violist Eoin Schmidt-Martin and the second violinist Michelle Fleming — making for a personal dynamic that bears watching. “You would be forgiven for expecting that the two couples would always have their own shared ideas and it would be one couple against the other,” Mr. Schmidt-Martin said. But the quartet probably agreed more readily about matters of interpretation than did groups with weaker personal ties, he said, noting that the Carducci musicians had with comparative ease found common ground on the sensitive issue of reining in the high-speed fortissimo, and thus tempering the melodrama, in the Shostakovich. As with the Carducci quartet, which has had no personnel changes for about eight years, the personal relationship between Ms. Perlman and Mr. Bailey is reflected in their performances. Ms. Perlman said that she and Mr. Bailey, who have been playing together for 15 years, had developed a system of “checks and balances” so that “if one person is feeling in revved-up gear, the other person can, when appropriate, tamp them down.” Some moderating of “youthful excitedness” had come naturally with age, she added, notably on Brahms’s intense Sonata for Cello and Piano in E minor, which is on the Sleepy Hollow play list. Mr. Bailey said that a period of personal and professional growth had paralleled the evolution of his relationship with Ms. Perlman, starting with their meeting at a music festival in 1997 — “It was fate that I met her at that very moment,” he said — and continuing to this day. She has, he said, offered many insights on life and the turning of a musical phrase, some of them gleaned from her father, the violin legend Itzhak Perlman. All of which Mr. Bailey has applied to solo efforts like his chart-topping recordings of the Bach cello suites in 2010. He will open the Sleepy Hollow concert with Suite No. 3. The kind of mature relationship Mr. Bailey and Ms. Perlman enjoy is still taking shape for Juilliard Baroque, the school’s newest faculty performing unit, now in its third full season. With nine high-powered period-instrument specialists on the roster, sorting through the complexities of working relationships can be a demanding affair — one that may be slightly more complicated for the Sleepy Hollow concert, the group’s first foray into Westchester, when three Juilliard graduate students will join the current and former faculty members. Sandra Miller, the group’s flutist, said that Juilliard Baroque, which has earned accolades on stages from Madrid to Manhattan, is molding itself into a true ensemble. Still, Baroque fare performed to period standards — for this all-Bach program Ms. Miller will use a reproduction of a mid-18th-century Grenadilla wood flute — is a kind of test for the programming aspirations of Friends of Music. Just as the contemporary repertory is often a stretch for the Friends audience, Ms. Weiner said, so is a historically informed performance. Nonetheless, the possibility of drawing new people to the series outweighed any potential down side. Friends of Music presents the Carducci String Quartet on April 14; Zuill Bailey and Navah Perlman on April 28; Juilliard Baroque on May 12. All concerts are at 8 p.m. at Sleepy Hollow High School, 210 North Broadway. Tickets: adults, $30 for each concert; students, $15 (free for Carducci concert). Information: friendsofmusicconcerts.org or (914) 861-5080.